The judge's order forbade him ever to see or communicate with his wife. They Can't Make A Coward Out of Me! All that Dr. Hyde suffered during his trials was as nothing to the years of heartbreak that followed his acquittal. He who had been in Hell was forced to plumb new and deeper Hells. The state tried Dr. Hyde for the murders of Colonel Thomas H. Swope, James Moss Hunton, and Chrisman Swope, and with having attempted the deaths of Mrs. Hyde’s four sisters, co-heirs of Colonel Swope’s great fortune. Found guilty and condemned to life imprisonment, he appealed the case, and the Supreme Court of Missouri declared him the tragic victim of an organized hate. The opinion flayed the prosecution, and after three subsequent trials. Dr. Hyde was released, an innocent man, in the eyes of the law. But he was to learn that his release did not return him to his old standing in society, although the law had not found him guilty. Incredible as it may seem, all that Dr. Clark Hyde suffered while undergoing trial as a fiendish poisoner — the pain, the shame, public hate, and the shadow of the gallows — was as nothing compared with the years of heartbreak that followed his acquittal. He who had been in hell for so long a time was forced to plumb new and deeper hells by the mean fears of his fellow men, in December for old friendship’s sake, seeing him for the first time since what was supposed to be his Vindication. Had he remained in prison, locked in some dungeon away from the sun and air, the years could not have treated him more savagely. Snow white hair thatched a face scored with lines that looked to have been gouged out by some jagged flint, and the bright blue eyes, from the very fixity of their courage, were weary eyes, unutterably sad for all their challenge. We talked for hours, and as the floodgates of his heart opened wide, he told of the loss of wife and children, of false friends and malignant enemies, of ostracism and shattered hopes, of loneliness and struggle, yet never once, in all the swift stream of his speech, was there a note of hate or bitterness. Strange indeed, for if ever one had the right to curse God and man, that one is Dr. B. Clark Hyde. Much of the tragedy lay in its unexpectedness. In April of 1917, when the state abandoned its prosecution, and the law confessed his innocence, Clark Hyde faced the future in joy and confidence. No doubt marred his happiness; no foreboding chilled the iron courage that had sustained him throughout his terrible ordeal. At his side stood the wife who had broken with mother, brothers and sisters out of her love for him, her faith in him; and two children, a boy and a girl, who had come to take the place of the little one who died at birth, in 1910. He was only forty-five, strong, resolute and still possessed of the splendid abilities and dynamic energy that had carried him to the forefront of his profession. And what more natural for him to assume than that society, having whipped him with thorns, would rejoice at the opportunity to atone for the cruel injustice that had brought him so close to a shameful end on the scaffold. What he did not count upon was the moral cowardice that squirms in the mud at the bottom of human character. At the time of his arrest and arraignment in 1910, Clark Hyde had been the examining physician for two life insurance companies, and while these posts had not been of any large importance in his days of pride, he now turned to them as a quick and necessary source of income. On presenting himself at the offices, however, he met with embarrassed attempts at evasion, and on pressing the matter, learned that the executives were of the opinion that his retention would “hurt business.” It was not that they doubted his innocence, they assured him glibly but simply that the notoriety of his case made further employment unwise. When the Sons of the American Revolution, of which he had been an honored member, ignored his existence, and when other societies dropped him from their mailing lists, Dr. Hyde began to see what he was up against. He saw it still more plainly when men who called themselves friends came to him with the advice that he go to some foreign country and start life over again under a new name. But there was fighting blood in Clark Hyde — blood of Edward Hyde, first earl of Clarendon, and blood of General George Rogers Clark — and the suggestion that he turn tail and run fired him to battle pitch. Jaws squared, he opened an office and set grimly to work to regain the profitable practice he had enjoyed before the charge of poisoning was brought against him. At the very outset, however, he was struck down by the action of his own profession. A Library Society had been recently formed by certain physicians — more of a social body than official — and Dr. Hyde was invited to join. He had no need of it and even the small annual dues were more than he could afford, but he leaped at the invitation, seeing in it the hand of fellowship and affection. His name went to a vote and was blackballed. For once his iron control broke down and out of his rage and hurt he wrote a letter to the president, charging that the action had been due to the enmity of members who had been on the pay roll of the prosecution throughout the trials, and who sought his continued disgrace in order to justify their acceptance of blood money. An angry letter, indiscreet in every line, and the Jackson Medical Society, obtaining it, straightway accused Dr. Hyde of “unbecoming conduct,” and moved for his expulsion. There was a vote of the full membership, and when a majority refused to uphold the charges, the matter was carried to the State Medical Society, and this body, by an absolutely arbitrary exercise of power, ignored the vote and ordered Dr. Hyde’s expulsion. Now came a complicated series of court proceedings. A circuit court judge denied his petition for a mandamus, the Court of Appeals overruled the circuit judge, and the Supreme Court overruled the Court of Appeals. Whichever way the marked man turned, he found advancement blocked. It was not so much that people were hostile as that they were afraid. He was the “notorious Doctor Hyde,” and what did it matter that the notoriety had not been of his seeking, and that a high court had found him the victim of persecution? The brave thing was to take him by the hand; the easiest thing to avoid him, and so it was that he found himself imprisoned by a wall of ostracism as high as that of any jail yard. And in the hour when his dauntless spirit flagged a terrible and unexpected blow struck him down. His wife sued him for a divorce. Mrs. Hyde, even more confidently than her husband, had counted upon his acquittal to work a change in public opinion, believing implicitly that he would be restored to his former high standing without question. The action of the insurance companies, the Sons of the Revolution and the hospitals, followed by his expulsion from the Jackson County Medical Society, were cruel disappointments, and as the months went by without any lessening of the organized avoidance, a profound despair possessed her. Back of this breakdown of spirit were many physical and psychic shocks, each one more violent than the other in its attack upon the seat of reason. The ghastly charges leveled against her husband; the break with her family; the three terrible trials; the death of her five — hour — old boy in 1910; her own long convalescence, with its overhanging fear of cancer; the anguish of soul to find that Dr. Hyde’s acquittal was without power to change the prejudices and fears of the community — what wonder that the unhappy woman gave up the fight and surrendered to melancholia? Dr. Hyde saw her condition not only with the eyes of a husband, but the eyes of a physician, and frightened as never before, he fought desperately to beat back the danger that threatened the foundations of his home. With the two little ones digging at his side, he grew the mother’s favorite flowers in the small backyard; at night he taught them those poems that she loved most, and sought to hedge her about with tenderness. For a while it seemed that normality had returned, and when Mrs. Hyde and the children left for the north in the summer of 1920, the parting was most fond. Dr. Hyde himself went to Washington on a business trip in September, but when there came a sudden cessation of letters from his wife, he hurried home in the grip of a vague alarm. He found an empty, shuttered house, and on visiting Mrs. Hyde’s lawyer, an old friend, to discover the whereabouts of his family, received the curt information that they did not mean to return to him. Everything, the attorney assured him, would be conducted in such a manner as to avoid notoriety, but even as the stricken man stumbled out into the street, newsboys were calling extras that carried the news in huge headlines. Engrossed by the consideration of his own and his wife’s problem, Dr. Hyde had forgotten the children. Or, rather, it had not entered his mind that he would not be permitted to share in their custody, or, at least, to visit them regularly. Now, striking through his daze like a lightning bolt, he heard the judge enter an order that forbade him ever to see or to communicate with his wife or his little ones. Leaning forward, with all the agony of his soul in his eyes, he implored Mrs. Hyde with a looked but she refused to lift her eyes. Small wonder that the man’s iron courage gave way. Throughout the seven years of accusation and trials: throughout three years of unsuccessful struggle to regain his place in society, never once had he bowed his head, but as he walked out of the courtroom, suddenly bereft of wife, children and home, despair engulfed him. Giving up his offices, and abandoning the profession to which he had devoted his life, the wretched man found work as a common teamster in the employ of a sand company. Two days only did he held the job and then the boss issued a curt notice of discharge. With what little money was left to him, he entered an automobile school, and took a course in mechanics, but when he had finished it and looked about for work, he found every avenue of employment closed against him. Now virtually destitute, he turned his face to Lexington, a little town some fifty miles from Kansas City where he had Spent his boyhood, the son of a loved and honored Baptist divine. A sister lived there, and from her he borrowed the money to go to New York for study that would fit him as an eye, ear, nose and throat specialist. For a year he toiled day and night, and then returned to Lexington and resolutely swung his shingle to the breeze. A typical Southern county seat, this little town of Lexington, its people kindly enough, but intensely conservative. They met Clark Hyde courteously enough on the streets and in the church, but they did not take him into their homes nor did they throng his waiting room. For ten weeks he sat in his office, and not once in the whole of that time did he hear a footfall outside his door or see the knob turn under the touch of a hand. The sweat stood out on his forehead as he talked of those terrible weeks. What if no one ever came? The fear froze his heart! To be forced to accept defeat — to creep away from the regard of those who knew him as though he were indeed evil and depraved — to drag out his days in some obscure corner of earth. No, no! Better death! At last one evening, just as he was preparing to lock up and go out for his lonely meal, there sounded a knock and in walked a worker from the coal mines on the edge of town. A stranger, knowing nothing of Hyde or his history, he had seen the doctor’s sign in passing, and came in to ask about a serious ailment of the ear canals. “I could hardly see him for my tears,” answered Dr. Hyde. The miner sent others, and through the break in the Chinese wall soon poured an increasing stream of patients. Gradually, as the people of Lexington saw him in church and watched his life, a certain amount of friendly feeling succeeded suspicion and avoidance. But like that unhappy master, whom disaster followed fast and followed faster, some blast of the old hate would blow in from outside just as he seemed to have won his fight. 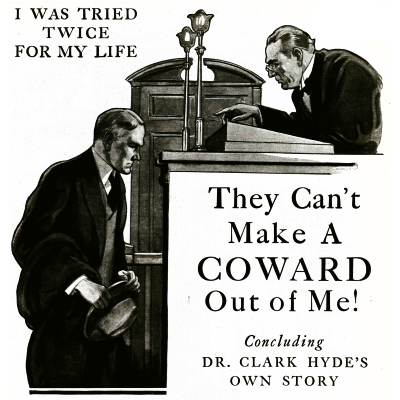 In 1929, for instance, a well-known lawyer of Detroit published a book on “The Cross — Examination of Witnesses,” and in it he spoke of Dr. Hyde as “the heartless murderer of Colonel Thomas H. Swope,” the author of “a series of horrible events unparalleled in the annals of American criminology,” and gave the impression that Dr. Hyde was an inmate of the Missouri State penitentiary, serving a sentence of life imprisonment. Under instant threat of a libel suit, the publishers called in every book, and accepted Dr. Hyde’s own statement of the case for insertion in the new edition. Turning around, he pulled out some programs that showed his membership in the Lexington Men’s Chorus, and a clipping from the local paper that commented on his interest in securing federal help for the improvement of Lexington’s battlefield. He put them forward with an effect of casualness, as if they were unimportant, but, shooting an upward glance, I saw a passion of pride in his eyes, a gratification so pathetic in its intensity that I could not swallow for the lump in my throat. To talk to the man is to come to instant appreciation of his essential loneliness, for every word shows that his companions have been books rather than human beings. “Have you never lost courage?” I asked him. Pain and weariness stood revealed as the cry came from him, but as I turned back after leaving him, I saw him straightening his shoulders bravely enough, setting his face in its former effect of determined cheerfulness, and putting the courage back into his eyes.